Hi we need a special T-Shirt design for our home country Tyrol! There was a guy who called &quot;Andreas Hofer&quot; he was a Tyrolean innkeeper and drover, who in 1809 became the leader of the Tyrolean Rebellion against the revolutionary Napoleonic invasion during the War of the Fifth Coalition. 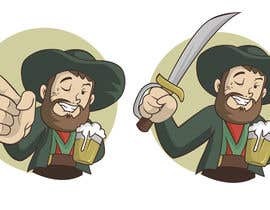 Attached you see a illustration (sample) which we exactly need but instead of the irish guy we need it with &quot;Andreas Hofer&quot; but also with a beer in his hand and the same gesture and same illustration style! If you got any question feel free to ask me! Waiting for your concept! Thanks! Sure waiting for your concept! Thanks! hey, does it need to be a digital draw? i can draw in watercollor and digitalize it. Yes its for an T-Shirt design ! Okay great waiting for your concept! Thanks!